Known for his typographic, language-based ‘sculptures’, the drawings permit a glimpse of Weiner’s thought processes and their development over time. 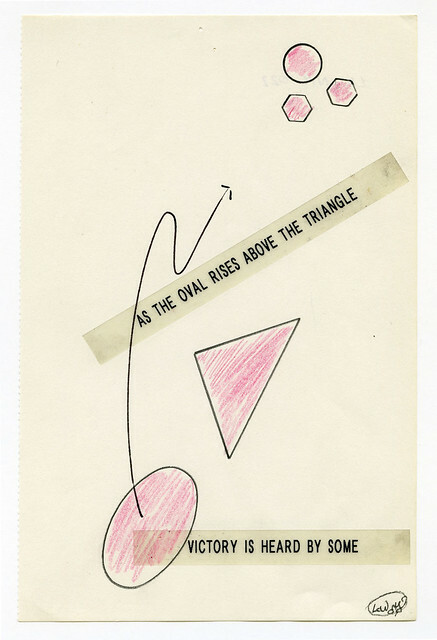 They are deemed sculptural for two reasons, first, the work is one material added to another – pencil, ink, paint on paper – and second, the seemingly simple outcomes are representative of a sculptural process that is distilled into a succinct, yet often oblique body of text with philosophical undertones. This is humorously highlighted in a piece reading, ‘Take the Bagel from Hegel & See Where it Rolls’. When Weiner feels limited by the constraints of language, he replaces words with gestural markings intended to be understandable to everyone, regardless of their spoken language. 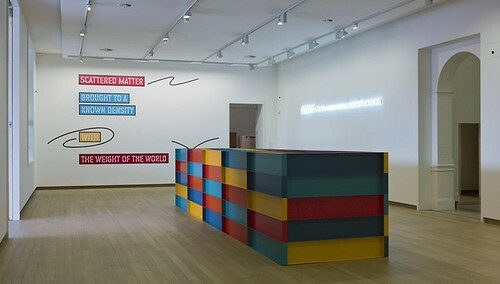 Photograph of Lawrence Weiner at ‘Written on the Wind’ (Op de Wind Geschreven), 2013. Photo: Martijn van Nieuwenhuyzen. 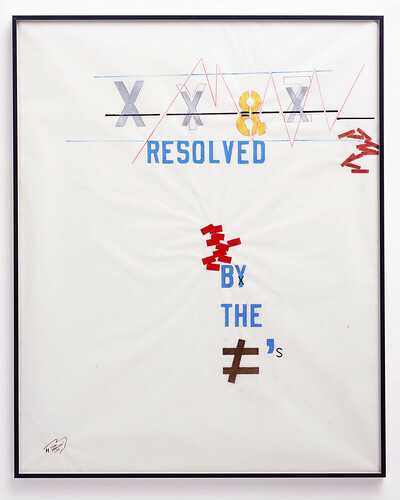 Top: Lawrence Weiner, Untitled (Financial Drawing [Resolved]), 2005. Courtesy of the artists and Lisson Gallery, London. Photo: Dave Morgan. 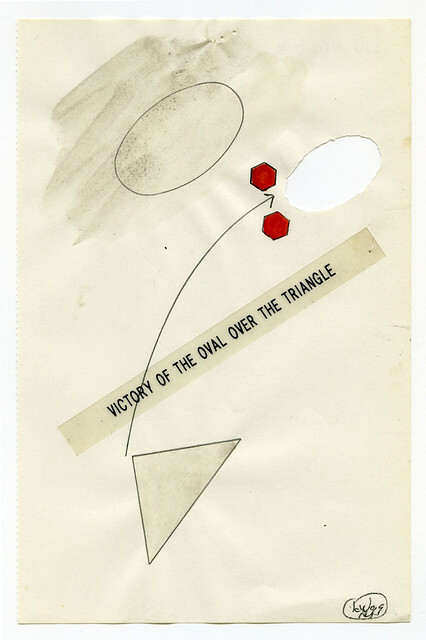 Lawrence Weiner, Untitled (Oval Over the Triangle [Victory]), 1999. Private Collection. In a forum discussion, Weiner said, ‘[I am] only intrigued in making work about things I do not understand … when a thought becomes tangible you can draw it’. Philosophy and contemplative studies of space and time are visible throughout, as well as drawings that focus on ideas of place, navigation and the scientific tendency to reevaluate ‘truths’. The nautical references seen throughout show his connection to the city of Amsterdam – where he moors a house boat / studio. ‘Maybe [my work] is just notating a map, drawing while travelling, drawing in hotels … Time is a very complicated arrangement’. 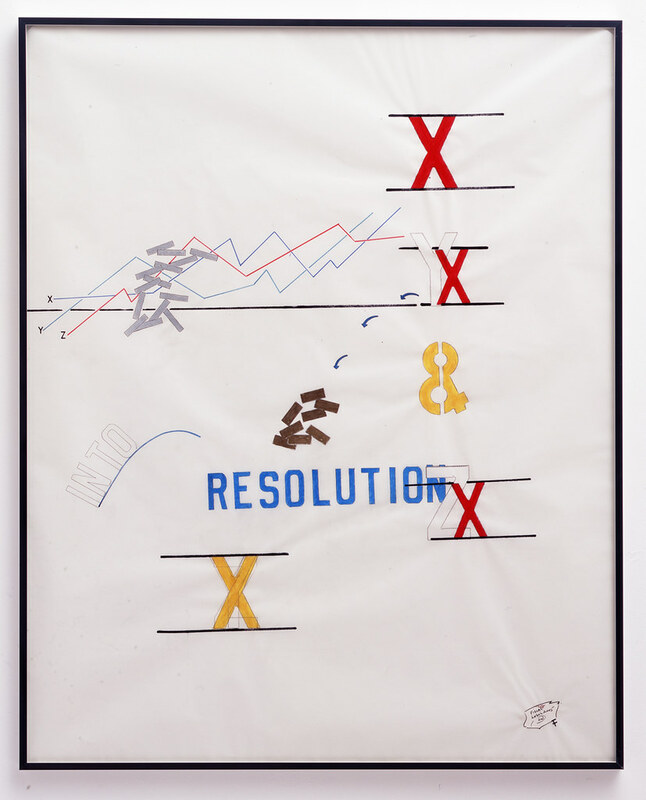 Lawrence Weiner, Untitled (Financial Drawing [into Resolution]), 2005. Courtesy of the artists and Lisson Gallery, London. Photo: Dave Morgan. Lawrence Weiner, Untitled (Oval Over the Triangle [Triumph]), 1999. Private Collection. Photography: Courtesy of Moved Pictures Archive, NYC. ‘Written on the Wind’ continues at the Stedelijk until 5 January 2014, and can be enjoyed alongside Weiner’s works in the museum’s permanent collection: What is Set Upon the Table Sits on the Table (1962-63) and Scattered matter // Brought to a known density // with // The Weight of the World // Cusped (2007) installed in the entrance hall, as well as An object made to resemble another by the Addition of a Sufficient Quantity of External Qualities (1988) on the building’s exterior, and the reinstalled Escalated from Time to Time // Overloaded from Time to Time // Revoked from Time to Time (originally produced in 1985), in the museum café. 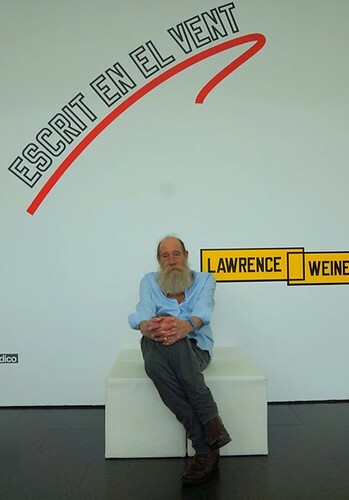 Lawrence Weiner in Stedelijk Museum, Amsterdam, 2013. Lawrence Weiner sculpture and Bruce Nauman neon on the walls, with Donald Judd sculpture in the foreground. Installation photograph by Gert-Jan van Rooij.